Allen Holubar (August 3, 1890 – November 20, 1923) was an American actor, film director, and screenwriter of the silent film era. He appeared in 38 films between 1913 and 1917. He also directed 33 films between 1916 and 1923. Allen Holubar started out as an actor on the stage where he met his wife Dorothy Phillips in the Chicago production of Every Woman. While she turned to the screen and continued to act he became a director and even produced. Encouraged by these successes, together they formed the Allen Holubar Production Company in 1920. His 1918 film,The Heart of Humanity, was exhibited at The Museum of Modern Art in 2014. 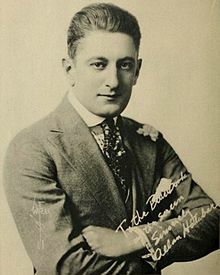 Holubar was married to actress Dorothy Phillips for eleven years from 1912 until his death in 1923 from pneumonia, following surgery, at the age of 33. Dorothy, herself, would also die of pneumonia in the year 1980 at the age of 90. ^ "Allen Holubar". The Tennessean. November 21, 1923. p. 5. Retrieved January 20, 2019. ^ Jr, Miloslav Rechcigl (November 9, 2017). "Beyond the Sea of Beer: History of Immigration of Bohemians and Czechs to the New World and Their Contributions". AuthorHouse. Retrieved May 3, 2018 – via Google Books. ^ Soister, John T.; Nicolella, Henry; Joyce, Steve (January 31, 2013). American Silent Horror, Science Fiction and Fantasy Feature Films, 1913_ÑÐ1929. McFarland. ISBN 9780786487905. ^ "The Heart of Humanity. 1919. Directed by Allen Holubar | MoMA". The Museum of Modern Art. Retrieved January 20, 2019. ^ "Franklin film (Holubar)". Newspapers.com. Retrieved January 20, 2019. Wikimedia Commons has media related to Allen Holubar. This article about a United States film actor or actress born in the 1880s is a stub. You can help Wikipedia by expanding it.